Presidential Commission of Inquiry to Investigate and Inquire into Serious Acts of Fraud, Corruption and Abuse of Power, State Resources and Privileges (PRECIFAC) which had held former President Mahind Rajapaksa responsible for allegedly causing a financial loss to ITN had recommended filing of legal action against him. The Commission had concluded that former President and three former officials of ITN had been guilty of causing the state TV channel a loss of Rs 102,158,058 by getting it to telecast his advertisements free of charge during the presidential election. It has held that the defendants have committed a crime under section 70 of the Bribery Act. The Commission had also recommended that ITN should be converted into an independent institution. 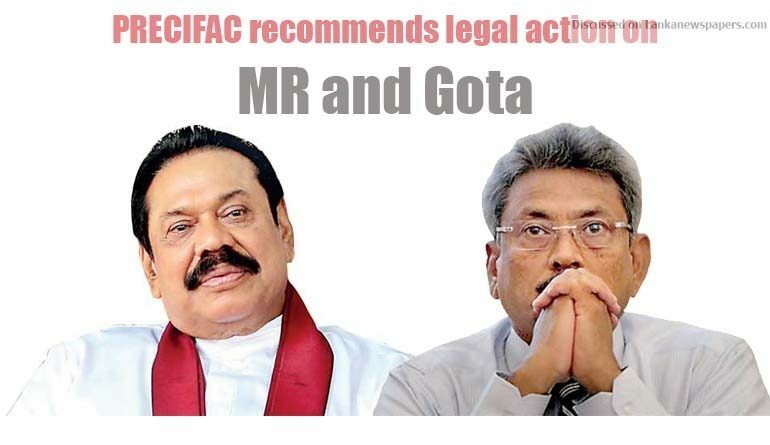 PRECIFAC has also stated that Former Defense Secretary Gotabaya Rajapaksa, Nissanka Senadipathi, Major General Palitha Fernando, and former Navy Commanders Sisirakumara Kolambage and Maximus Jayaratne had committed an offence as per section 70 of the Bribery Act. The Commission had recommended that focus should be made on taking legal action against the said persons. In addition, former MP Duminda Silva has been held responsible for using Rakna Lanka employees for political activities. Looks like U have reactivated the forum, and thank you.